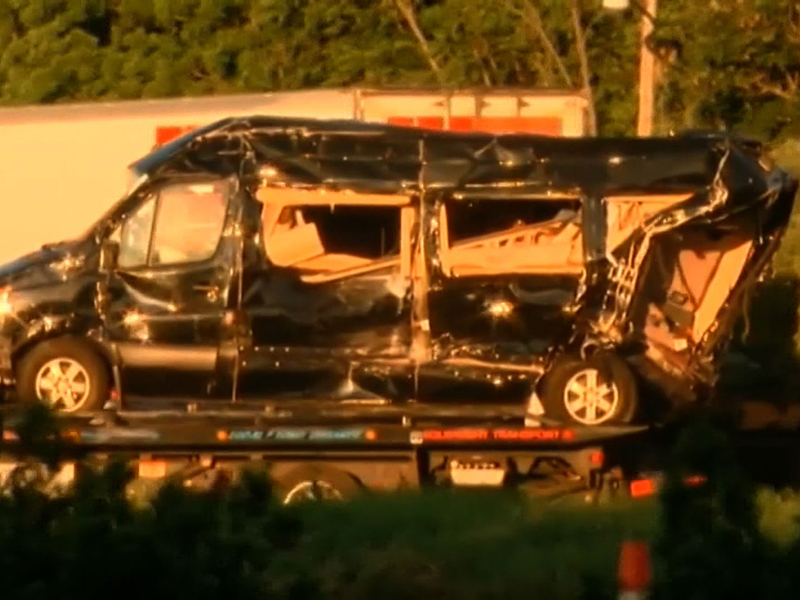 A Georgia truck driver was charged Saturday with causing a multi-vehicle crash on the New Jersey Turnpike that led to the death of a passenger on actor Tracy Morgan's limousine bus, authorities said. Kevin Roper, 35, of Jonesboro, Georgia, was charged with one count of death by auto and four counts of assault by auto in the early Saturday crash, Middlesex County Acting Prosecutor Andrew C. Carey and Col. Joseph R. Fuentes, superintendent of the New Jersey State Police, announced late Saturday. One of Morgan's writers, comedian James McNair, 62, of Peekskill, N.Y., died in the crash while riding on Morgan's chauffeured limo bus. Morgan, 45, and two other passengers remain in critical condition at Robert Wood Johnson University Hospital in New Brunswick, N.J., authorities said. "His family is now with him, and he is receiving excellent care," Morgan's publicist Lewis Kay said in a statement to CBS News. "We don't anticipate much of a change in his condition today." A fourth passenger was treated at the hospital and was released. Roper's bail was set at $50,000, and authorities expected him to surrender. While the cause of the crash remains under investigation, authorities say a preliminary investigation determined that the tractor-trailer Roper was driving crashed into the van, a 2012 Mercedes Sprinter. Four other vehicles were involved in the crash, but none of the occupants was injured. Morgan was returning from a live performance in Delaware, part of a multi-city standup tour. Comedian Ardie Fuqua, who was traveling with Morgan, posted a photo of the bus to his Instagram account about 30 minutes before the accident. He is also in critical condition. Morgan, who began his career doing standup on the streets of Brooklyn, is best known for his seven years on "Saturday Night Live" and his lead role in the comedy "30 Rock." In April, he appeared on "CBS This Morning" to talk about his new comedy tour. "I love it," Morgan said when asked how he felt about being onstage. "It's exhilarating. You know, there's nothing in the world like live entertainment." The 45-year-old actor also spoke about his family. He has three grown sons from a previous relationship and a 1-year-old daughter with fiancee Megan Wollover. "That's my baby," Morgan said in April. "That's my girl. She has given me a different perspective on being a dad, so I see things a little bit different. I have a beautiful baby daughter. I also have a shotgun, a shovel and a alibi."